A filler from Tuesday evening.because I have just got back from a lovely day out. For my birthday last December, today two of my friends took me to see the Isabella Blow exhibition which is on at Somerset House in London. It was fascinating and we also managed to go to see the David Bailey exhibition at the National Portrait Gallery - brilliant! Then we queued to see the two Van Gogh sunflower paintings which are currently on display at the National Gallery. I know this is going to be a bit controversial but they did leave me a bit cold. I much prefer a lot of his other work. So that's my annual quota of 'culcha' all ticked off in one day. A quick meal in Chinatown and then back home. All good fun, but completely knackering - off to bed now. Night Night! Fantastic shot and glad you had a good day! Sounds like a wonderful day! 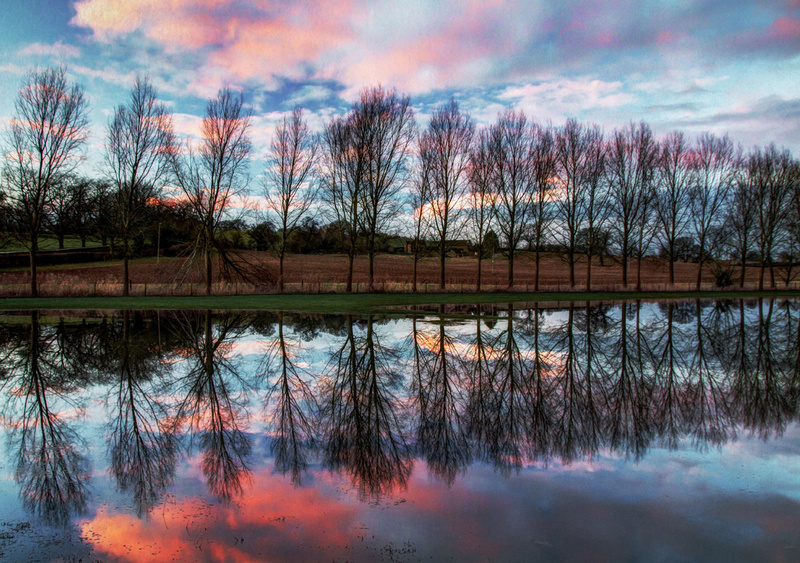 Lovely line of trees and love the vivid colors of the sky and in the reflection! That reflection is simply gorgeous! fav! The overall balance in this photo makes it peaceful and appealing. Fantastic! Fav! This is just Wow, really Wow! Fav, of course! You lead a busy life! Stunning picture, and a fav for me. Stunning shot, the reflections are fantastic! Incredible shot; incredible day! fav. Goodness you packed it all in, sounds like you had a fab time though. This is a lovely shot the reflections are amazing. Gorgeous reflections and colours!! FAV!! A really super capture and a Fav. Absolutely beautiful shot, stunning relfections and lovely colours. Fav.